Manilla Road's official 6th full length is the last of what many older Manilla Road fans consider as their most classic period. 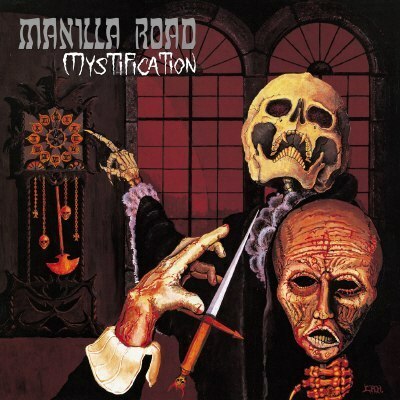 Manilla Road's "Crystal Logic", "Open the Gates", "The Deluge", and "Mystification" are considered the bands best years. Even though they're one of the very few long time running Heavy Metal bands that are still putting out great Heavy Metal records, those 4 albums are the golden years. What's great about this album is that it's the first time they've really injected a Thrash Metal sound into their music. They've had some faster songs on other albums, but there's no mistaken some of the songs are intense quality Thrash Metal you'd hear Slayer do. They mix the Classic Metal and Thrash Metal extremely well here because there's no doubt Mark Shelton is one of the best Heavy Metal songwriters of all-time. Also what's important about this release is that this is the very first time it's EVER been released on CD in the original song order along with the original mixing and mastering. This will be a huge treat for fans that have never heard the album this way because the re-issue done in the year 2000, was mixed and mastered differently along with the track order switched around. You'll finally be able to hear the way it was originally was back in 1987!